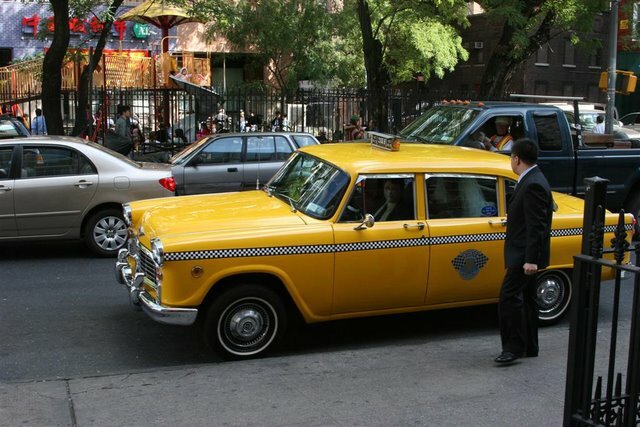 As I mentioned in a previous post, we got a 1960s checker cab instead of the usual limo option. Despite my mother and aunt's protestations about not having an "appropriate" method of transportation and the extra finagling for rides, I loved this part of the wedding and didn't regret it at all. It was a great conversation piece (some of our friends still talk about it to this day) and it made a wonderful prop for photos (even for other ppl getting married that day who stopped by to snap a photo, the driver told us). 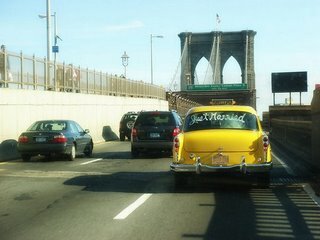 I think the cab, quintessentially New York, was also cool enough to stand alone and not need any of the excess decorations that ppl sometimes put on limos, just a simple "Just Married" written on the back window by the driver after the ceremony. 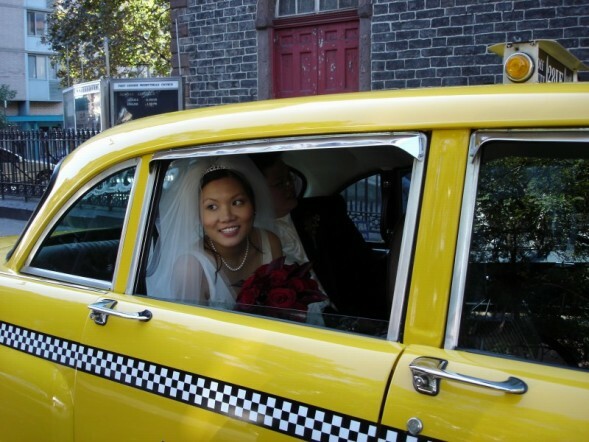 The cab is also roomy (though not roomy enough for all the bridal party + photographer & his assistant so FIL ended up getting some van to drive them b/c BIL didn't want to drive) and a head-turner. Along the way, ppl honked or waved, with a huge smile on their face (I'd like to think they were honking for me, but I think it was really for the cab). And for a few moments on one day in my life, I savored the attention (but once I was out of the cab, it was a different story). 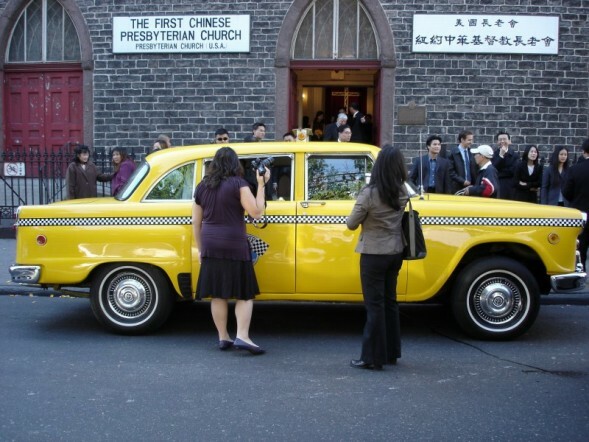 Because the cab was a few minutes late (which he apologized profusely for and also offered to stay a little later at the end to make up for it), waiting for it to bring us to the church was tense, since the alloted time to get to the church was already tight on the schedule. 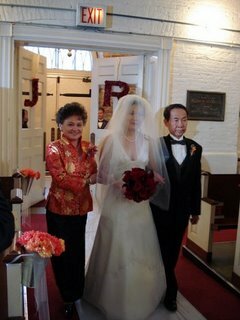 It did, however, give me a chance to call Dear (who arrived at the church hours earlier), which was nice, without ruining the seeing the bride beforehand thing. The cab's driver (totally forgot his name already), was really nice, though a bit inexperienced about driving downtown, in my opinion. There was crazy traffic that afternoon and it took us more than half an hour to get where we needed to go (it should take only 10 minutes) and he took a wrong turn on Centre Street and ended up making a U-turn. Of course he apologized profusely for this and I don't hold this against him in any way but I am just relaying events as they happened. And so that you don't think I'm just hypercritical, I'll add he was nice enough to go out of the car and get me a drink from the trunk during a red light. Other than the lateness, everything with the cab was wonderful. All this for $400 for 4 hours (includes tip already) -- not bad, if I do say so myself. 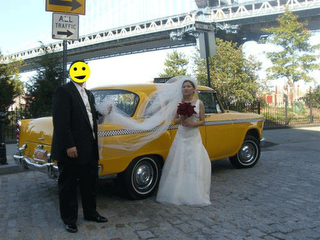 (The one limo company we contacted b/c of my mother's concerns quoted $450 for the same amount of time and he was already very busy for our day, and could only *try* to squeeze us in.) Anyway, if you want to make a unique statement (there are other cars available besides checker cabs), the owner of Film Cars is super nice (but was unfortunately busy on that Saturday for some movie shoot -- who would put Denzel Washington ahead of me?!) and I highly recommend them. Throughout the day, everything felt very surreal, like I wasn't there and I was watching this person do everything. It didn't sink in until much later, like towards the end of the banquet. 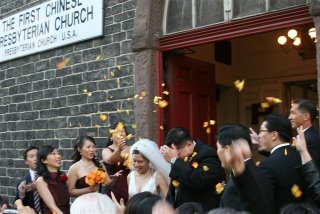 So I barely remember anything about the ceremony and things just magically happened thanks to our hard-working helpers -- my bouquet was brought to me, everyone got the right flowers, the guests were seated without any major problems. 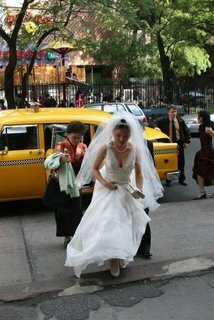 I just remember thinking to myself that I didn't want to be late and to keep everyone waiting (but I was -- sorry! 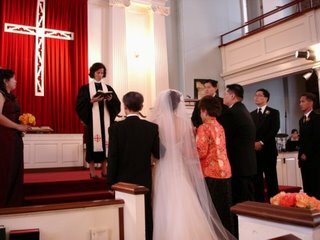 ), then everyone walked down the aisle like they should have (still waiting on pics of that) and when it was my turn it felt very weird to have all eyes on me. It was nice to catch glimpses of ppl I recognized (the sight of some ppl actually made me smile) and see them beaming at me, almost like I was a queen for a day. I remember chastising my father for stepping on my dress (he kept doing it, which made it difficult for me to walk, with all the stop and go) and then the three of us (I wanted both my parents to walk me down the aisle) stood at the front until the reverend gave them the sign to kiss me and sit down. People tell me that my parents had trouble reaching me (since they are shorter and I was wearing 3" heels) and that it seemed like they didn't want to let me go (there was a long pause when they were supposed to sit down but they didn't, even though the minister motioned for them to -- I think they forgot what they were supposed to do, or never really understood). Then before I knew it, the readers did their thing (and more, much to my dismay -- one of them decided to add his own little speech); we listened to the trio playing "Ode to Joy" (I have no idea who came up with that song, b/c I don't think I requested it, but I didn't mind it); rings were exchanged (repeating the vows were weird too, like taking on a huge responsibility); and we walked back down the aisle as husband and wife. There was then the receiving line (bizarre, but nice to see so many ppl, even ppl I haven't seen in 20 years or so) and I was so parched I don't know how I was able to smile and chat with so many ppl. The petal toss felt really short and then we returned inside and were tortured with a portrait session that someone set up without my permission (I didn't really want to do this, especially not at the church, with daylight burning). What pissed me off the most was that the order was totally biased towards Dear's family (all his extended family, and I think even church groups, took pictures before my family got the chance to). I think they even called up our co-workers (none of whom went up b/c it's not really appropriate) and ended the session (someone said, "OK, that's it!") before Dear reminded them that my family hadn't gone up yet. 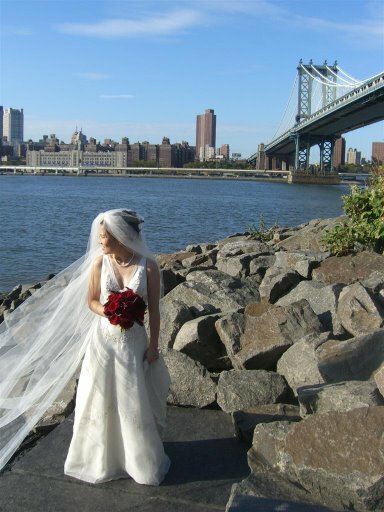 But my inner bridezilla didn't rear her ugly head and it ended soon enough and we were whisked away to Brooklyn Bridge Park in DUMBO to take some pics with just the bridal party. It was a gorgeous day to take pictures outside and it was kinda fun to do so (I spotted 4 other groups taking pictures at the park too). After a while though, it did get tiring. At least Dear and I were able to amuse ourselves with the photographer's constant demands for kisses (some poses were really silly) and that forced at least one of us to smile. 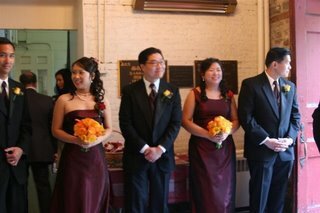 :) One thing I noticed though is that my eyes are always closed! Good thing the photographer was able to see this on his digital camera and could make us re-take the shot. Because of the photo session at church, we didn't have time to go on the Staten Island Ferry (especially sad for Dear since he loves the water) and we just stayed in DUMBO, which wasn't too shabby either.